Aside from being the country’s premier night food market destination, MercatoCentrale has helped give birth to some of the country’s newest and most innovative food concepts. Popular chains like Manang’s Chicken, Merry Moo Ice Cream, Mochiko, Brasas Latin American Street Food, Spring by Ha-Yuan, Kristina’s Premium Inutak, Baked by Anita, and many more started off as food stalls in MercatoCentrale before they became successful food businesses. But prior to their multi-million food ventures, many of these entrepreneurs started off as home-based food businesses or just passionate cooks and bakers who had a pioneering food concept, unique style of cooking, or a secret or heirloom recipe that they ‘incubated’ in the MercatoCentrale food market. 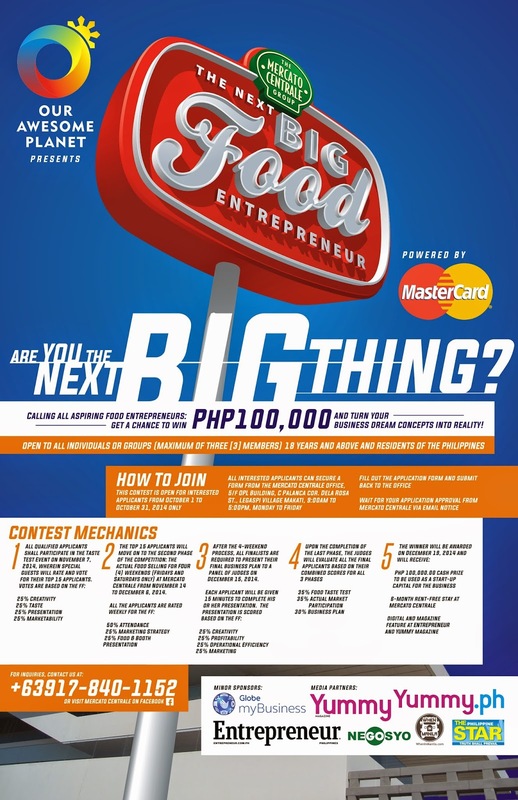 Building on its commitment to support food entrepreneurship, MercatoCentralebrings back its much-awaited “Next Big Food Entrepreneur Contest” along with www.ourawesomeplanet.com, Mastercard, Globe My Business and partners Entrepreneur Magazine, Yummy Magazine, Yummy Ph, Philippine Star, WhenInManila.com and Go Negosyo. Now on its third year, The Next Big Food Entrepreneur contest is a culinary showdown that provides an opportunity for budding food entrepreneurs from all walks of life to turn their food business concepts into reality! The winner of the contest will get PHP 100,000 start up capital, a rent-free stall in MercatoCentrale for six months, and a feature in Entrepreneur Magazine, Yummy, The Philippine Star, WhenInManila.com, Globe My Business Digital and Our Awesome Planet. The Next Big Food Entrepreneur is open to all aspiring food entrepreneurs, ages 18 years old and above, residing in the Philippines. The contest is divided into three parts: a food taste test activity for all interested participants, a four-weekend open market selling event at MercatoCentrale, Bonifacio Global City for all participants who pass the taste test, and finally, the submission of a business plan. The cut-off for all interested participants for the food taste test is October 31, 2014. For more information on how to join the contest, please visit MercatoCentrale on Facebook, https://www.facebook.com/mercatocentrale, or contact +639178401152 or +6329175857989. This post is a press release provided by the organizer.